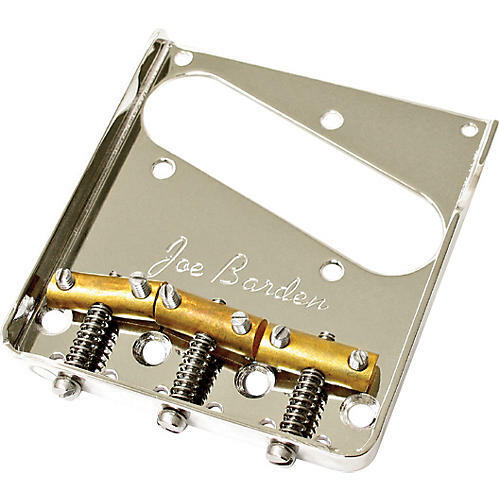 Joe Barden American Standard Tele Bridgeplate and Saddle Kit for Telecasters solves all of the structural problems and intonation issues inherent in the original parts. The heavily plated Bridgeplate is made of the same material as the original, but slightly thicker, making the plate less prone to unwanted squeal. Using the originally spec'd material ensures that the vintage tone and slightly microphonic nature of your Telecaster will not be lost. In addition, the Bridgeplate features a Danny Gatton-inspired scoop at the front of the treble sidewall, a tremendous aid to fingerpickers who find the sidewall obtrusive. The Bridgeplate has two additional mounting holes at the front edge to provide secure fastening at all four corners. Use of these mounting holes is optional. Which one do I need, the Vintage or American Standard bridgeplate? Two models of the Joe Barden Telecaster bridgeplate are available; Vintage Style or American Standard Style (see our SKU# H71203). The two bridgeplates are NOT interchangable and selection of which one to use is dependent on where the mounting and string thru holes are on your particular instrument. Both Joe Barden bridgeplates have 4 mounting holes at the rear. On the American Standard bridgeplate, just IN FRONT of the 4 mouting holes are 6 string-thru holes where the strings come thru the body. In contrast, on the Vintage bridgeplate the string-thru holes are just BEHIND the 4 mounting holes and closest to the rear wall of the bridgeplate. The Joe Barden saddles (3 come with the Bridgeplate Assembly) are also made to vintage specs, using the brass material, but have their adjustment holes drilled at three different angles to provide correct intonation for all six strings, each of which requires a different saddle position. As an added feature, the outside saddles are notched under the "E" strings, like the vintage '53 saddles. This notch helps correct the "loud outside string" problem common to many Telecasters, and adds additional height adjustment capability, while retaining an important and authentic vintage design spec. Like Joe Barden pickups, these components are direct retrofits for vintage, or American Standard styled Telecasters and similarly made guitars. Installation requires no modification to vintage instruments that would otherwise alter their unique vintage character. Improve your Tele with this perfect fitting bridgeplate kit.